Crack detection in aircraft engine and other high-energy rotating parts is extremely important, because uncontained failures can result in serious damage to equipment and loss of life. (For an example, see NTSB report NTSB/AAR-98/01). High length-to-diameter (L/D) bores, like tie-rod holes found in aircraft engine fan hubs, present a particularly difficult challenge for airline NDT staff. Visual inspection of these small diameter and deep holes can be compromised by poor access, operator subjectivity and fatigue. 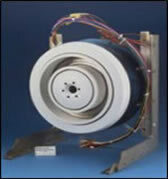 LTC's laser profiling sensors are ideal for applications where precise measurements must be made in a confined space. Unlike typical laser-based surface mapping systems that project a line or spot from a large external source, LTC's LP sensors use laser diodes and miniature optics, making them small enough to reach inside the annular cavity. 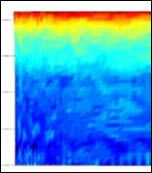 In addition, the LaserVideo™ image dataset from the laser sensor provides valuable qualitative information about the surface condition. 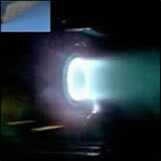 The US Air Force contracted with LTC to adapt the Laser MicroMap™ system to provide three-dimensional maps of both the conical "inner guard ring" and the cylindrical "outer guard ring" of a developmental Hall thruster. LTC provided a system with a custom laser profiling sensor and a three-asix stage-based delivery mechanism, combined with our standard LP-2000™ Control Unit and LaserViewer™ software. This system was able to map virtually 100% of the anode surface, with a spatial of 0.001 inch (0.025 mm) and a depth resolution of 0.0002 inch (0.005 mm). 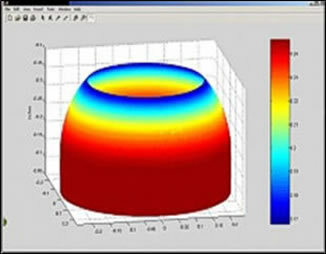 The images below shows scan data that has been imported into MATLAB™. More information regarding Hall Thruster Erosion Measurement.